San Diego store focused on kayak fishing. A lot of articles and info on local kayak fishing. Excellent forum, mostly private boaters but very useful. Great kayak fishing forum out of San Diego. How To's, Articles and the latest kayak fishing news. 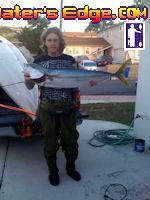 3 locations specializing in kayak fishing, freediving/spearfishing, scuba diving and kayaking. Offering kayak fishing classes, kayak rentals and sales, electronics and accessory installation and large selection of accessories. Visit oexcalifornia.com to see what each store offers. Preferred brand of kayak by many san diego kayak fishermen. Designed for kayak fishing with excellent performance.